Konuma Pond (小沼) is a lake on the top of Mt. Akagi. The altitude of this lake is 1,450m. It is a very popular hiking spot in Akagi area. Because it is high up in the mountain, It has great Koyo starts in the middle of October. 1. use bus to Fujimi Onsen. It is made of volcanic vent of one of volcano in Mt. Akagi. There are three other lakes at Mt. Akagi. 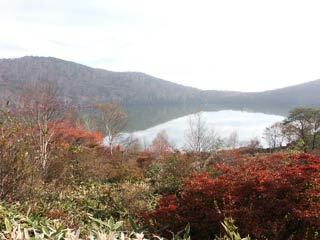 The Oak forest around the lake is a popular hiking course, especially Koyo, the autumn leaves. There is tragic story of this lake. The 16 years old daughter of Akahori Dogen commit suicide at this lake and became the dragon. This dragon became the lord of this lake.